10.05.2005 - While most rats tend to stay in the attic or wall voids, rats do often get inside the living space. Trapping rats in livable areas is a different matter than doing it in the attic. In the attic, I can set traps all over the place, with no concern of a person or pet encountering them, nor worry about the sight of a trapped rat. But inside the home, there's human hands, feet, dogs, cats, and little children. I can't just leave a finger-breaking rat snap trap laying about in such a place! Plus, many people don't ever want to actually see a rat. Thus, I have a solution for when there's rats in the kitchen or bedroom. I set this special closed-unit lockable rat trapping station. It's basically a box with a lid that opens, and there's a chamber inside in which a special trap is set. The rat goes inside the box and is caught inside. The locked box is pet-proof and child-proof, and only a rat can fit through the small hole and get to the trap chamber. The above photo shows a rat trapped in one of these rat bait boxes. 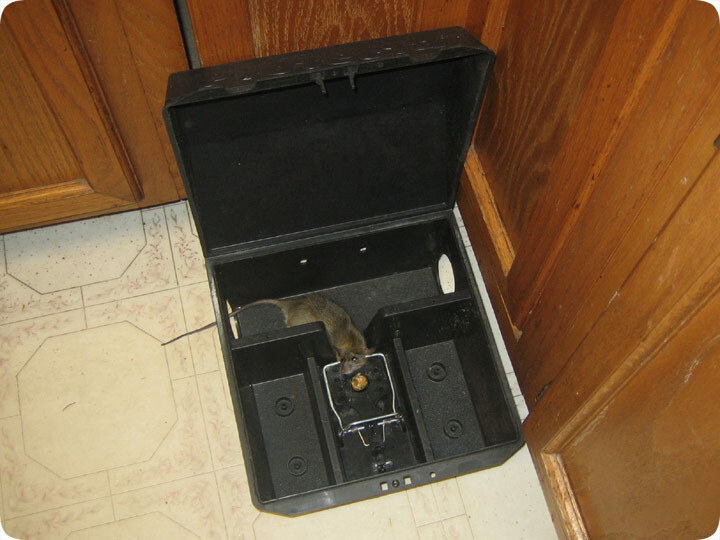 The best way to trap rap a rat in a bait station box is to set it in the areas the rat has been known to travel, with the opening flush against a wall, and baited with rat favorites, such as peanut butter, or whatever food the rat has been seeking. In many cases, the rat is entering the house to eat pet food that is left out. If that's the case, I sprinkle some pet food inside the internal chambers to help lure the rat in. The customer doesn't have to see the rat (though the tip of the tail often sticks out the entry hole). So if you need to trap rats inside the home consider doing it with a rat bait box.